...while the women sat in Keter chairs that had been stacked in a corner. Item: I attended a lecture on Derech Eretz held in an Orthodox shul. Separate seating was set up for men and women. The men sat in the regular men's section and the women were seated in rows of folding chairs that began behind the end of the men's section. I arrived on time and paid the same price for admission to the lecture as men were charged, yet the very best seat I could get was further away from the speaker and less comfortable than the seating available for men, including those men who came late. Did I mention the topic of the lecture was Derech Eretz? Item: Praying in a certain Orthodox shul for Yom Kippur, it is impossible for me to see when the aron kodesh is open. The only way I know to stand is from the scraping of chairs and the rustling I hear coming from the men's section. Item: In an Orthodox shul I attended while visiting family in another community, the men's entrance was through decorative double doors in the front of the building. The women's entrance required me to pass by the shul's dumpsters, enter an unmarked door on the side of the building and climb two flights of stairs. Item: The blogger A Mother in Israel recently hosted a guest photoblog by photographer Rahel Jaskow which chronicles the many ways in which the space for women at the Kotel is compromised. Item: Though my husband and I were the first ones at a concert of Jewish music being held in an Orthodox shul, and despite the fact that I was charged the same ticket price as the men, I was told I must sit in the cramped women's section behind tables two rows deep and to the left of the performer. Men had their choice of seats facing the performer and had plenty of room to dance. A man who came 45 minutes late was able to sit two rows from the performer. I could continue with similar examples of a lack of derech eretz I've experienced as a woman over the years, in different communities and in different countries, but I believe the point is clear. We in the Orthodox community have a derech eretz problem when it comes to women in synagogue spaces. I'd like to assume that it's a problem of oversight rather than of intentionality. Please don't misunderstand me. I'm not suggesting that I want to wear tefillin or serve as a ba'al tefilla or be called for an aliyah. I'm not inherently opposed to separate seating for tefilla. Please don't conflate and thereby dismiss what I'm saying because my point is based on gender. I'm not revealing my disdain for being a Jewish woman and I have no secret desire to be a Jewish man. I'm a committed, faithful Orthodox woman, married to a former pulpit rabbi, who would like to be treated with dignity whenever I enter an Orthodox synagogue.That hardly seems like a controversial expectation. I'm speaking here about derech eretz and kavod habriot - the simple human dignity of women that is often violated in public Jewish spaces. No woman should have to feel diminished because of thoughtless spatial planning. I imagine that most people involved in making decisions that lead to these sorts of circumstances are not intentionally hostile toward women but are rather unaware of the consequences of their actions. I believe these are, in the main, sins of omission rather than of commission. My intention here is to draw attention to the issue in the hope that, by sensitizing more people to the unintended consequences of careless synagogue design, things can change for the better. Yes. Yes. Yes. I realize that men are obligated to pray three times a day with a minyan, and therefore it makes sense to ensure that the men's section is comfortable and spacious. But since women are encouraged to pray, and events are held in synagogues for both men and women, it also makes sense to have a women's section that is comfortable and spacious whenever possible. It would be, and is, a shining example of derech eretz in those shuls and at such events that offer side-by-side seating, where it seems that women are respected as being in tune with Hashem and not half forgotten about. Amen, 100%. I experience this frustration in my own shul, which to be fair is a cramped caravan while we wait for a building. But this past Purim I was in shock, like many Purims before, when everyone knows the women's section becomes packed bec most of the children flock there and they never shift the movable mehitza. I'm tired of standing outside and missing the reading. Rivkah, thank you for bringing this up. I agree with you completely. I think the problem has two main causes: First, unfortunately, many/most frum men have been educated, both in yeshiva and at home (yes, by their mothers) to believe that the women of the world are less important than they are and exist for their benefit. If they say they have the highest respect for women, a lot of them don't mean it and a lot of them respect women only when they are in the home, as if they don't belong anywhere else. (I didn't say that Judaism doesn't respect women, only that many Jews don't. Not the same thing.) There is all the mythology about our righteous grandmothers who put up with everything and never complained. In addition, because there is so much extremism out there in the world, they have the convenient out of labeling anything they don't like as Reform and feminism (a dirty word in many circles, including many people we would think aren't like that). Second, women themselves/ourselves are our own worst enemies because so many of them/us put up with this garbage. Some of it is the attitude of "Why bother? Accept what you can't change;" some of it is that same belief about women as I mentioned concerning men; and some is the idea that any kind of speaking up for yourself/ourselves, especially if it may lead to confrontation, is immodest. This is how many/most frum women were educated; it think that earlier generations, who had less formal Jewish education (as in Bais Yaakov, etc.) were actually more assertive. Add to that the inherent desire that most women have for approval at any price (the real "curse of Eve," in my opinion) and probably an inherent preference for making peace and avoiding confrontation (usually a good midah), and that explains a lot. This won't change until both girls and boys are educated differently. In the mean time, we can try to educate both men and women, and try to convince those who feel as we do to speak up. I have been in any number of shuls that have beautiful, comfortable women's sections. I have also been in tiny, cramped, awful spaces. I was once in a women's section - while saying Kaddish - that was an enclosed balcony so high up, I literally could not hear a single thing and missed saying Kaddish. I also have no wish to have men's obligations, and I *like* sitting separate from the men. That doesn't mean we have to walk past dumpsters and squeeze ourselves into tiny spaces. The fact that I have been in lovely spaces is proof that it can be done. And there is no reason not to. I can say that here in Bat Ayin they actually do have a nice area for women in the main synagogue. Even with that though, I miss the mehitza being down the middle and being able to see the bima. My husband I usually don't go to events that we can't sit together anymore because we both work and when we go out we want to enjoy the time together. It seems that in religious environments, when space is scarce, women are always the ones who are asked (or not) to give up space, to make concessions, to accept a less respectable environment than the one given to the men. The kicker is that the ones who do this (out of mere ignorance or thoughtlessness, I hope, not out of malice) are the same ones who go on about how Jewish tradition honors women highly and how women should be content with that high honor and ask for no more. Kol Hakavod. I agree 100%. It's just about derech eretz; not trying to be like a man. When I was in Monsey, I davened at a shul where the women's section was upstairs in the balcony. Downstairs the men sat on seats the were separated one from the other by armrests in between each seat. They were also upholstered. Upstairs the women sat on long wooden pews (benches) that were hard, and had no armrests, save for one at each end. This shul did not have makom kavua during the year, but it did assign seating for the Yomim Noraim. I always sat in the front row of the balcony, I needed both the proximity and the clear view in order to hear and participate in the davening, given my disability. When the seating charts were set up, nearly every woman who normally sat in that front row was assigned to that front row. But there was also a particular family who were members of the shul and who donated a lot of money to the shul but who NEVER CAME TO SHUL!! NEVER. Not occasionally, but NEVER. And they insisted on being seated in the front row of the balcony. Instead of redistributing the seating allocations the men who were in charge of the seating arrangements (Yes, it was ALL MEN!) simply assigned more women to that pew. After all, they reasoned, there were no armrests in between, meaning they could put as many people, uh excuse me, as many women, as they could into a pew. But this pew was designed to hold at most, 12 women. Now quite a number of the 12 women who were assigned to sit there who REGULARLY come to shul were, well, overweight. And several of the women from this rich family who insisted on sitting there were also overweight. The men assigned 16 women to this pew. There was absolutely no way that 16 THIN women could fit in this pew! As you can imagine, there was a lot of shoving and complaining about the seating. One of the women, from this family, yelled at me for sitting in the pew telling me, that I am a newcomer (I was, that first year) and that I am YOUNG so therefore I need not sit. Even though my seat was as fully paid for as theirs. It was terrible. They did this year after year after year. Of course, there was no such problem in the men's section. Kol hakavod! I agree with you completely. Great post Rivka! Our Young Israel in Cleveland has side-by-side seating and I missed that very much when we made Aliyah, especially since the first shul we attended has curtains and terrible acoustics and KETER chairs! I had to stop attending because I couldn't sit there for more than 30 minutes without sciatic pain. 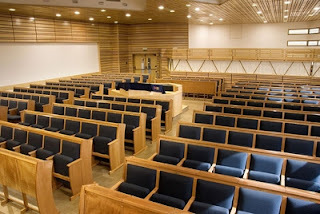 The South African shul we attended in Ra'anana was very nice, and although I did have to climb stairs the acoustics in the balcony and the nice upholstered seats with arm rests and schtenders (same as the men's) mad the experience worth the effort. We entered through the same lobby as the men and the walls are lined in marble. Nusach Achid - in upper Klei Shir has a similar seating arrangement and I like it, especially because there aren't any curtains (just wooden slats). I can easily see the bimah and aron from my seat and am able to hear just about everything clearly. Amen Dr. Adler! Imagine being a part of a Sephardi synagogue; it seems even worse. I couldn't agree more with your points, thank you for posting. Send the Rabbi a big Shalom from Isak and Carolyn in Baltimore. I hope that men also read your blog. When we lived in pittsburgh, I would go to the shul erev Shabbat and Yom tov and set-up the women's section by myself in order to make sure the women had a proper and comfortable place to daven. If I didn't do this there would be nowhere for the women to sit. The men could really care less about the women's section. Out of sight, out of mind! Can I add something else? What about places without room for women. I'm a man and this offends me. The minyan in my office building in Jerusalem has no place for women. A woman CAN NOT daven there. I have a hard time feeling that it is permissible for me to daven in a place that blatantly excludes women. I see it pretty differently. The men are the ones who have the actual obligation to pray 3x a day in a minyan (at shul), not us women. So it makes sense to me that is Israel, where there aren't high membership dues at shuls (as there are in the U.S) that the men's section is the first and main place where the nicer, permanent seating is placed. Women in most Orthodox shuls only attend services 3 times max during the entire week (on shabbat) as opposed to the men who are there 18+ times a week. That's my take! Its just a mixture of oversight, the fact that men arrange chairs and often order them thinking women rarely attend shul, shiurim or whatever. Its really no different for the men when you consider mikvot. The women's mikvah I go to has heated rooms, a cleaning lady after each woman, chandeliers, a wall size aquarium, granite and marble everything and cute little gifts of closet scented satchels and slippers. The men's mikvah however, is one nasty little dive. Yet no one speaks out in their defense. Couldn't agree more! 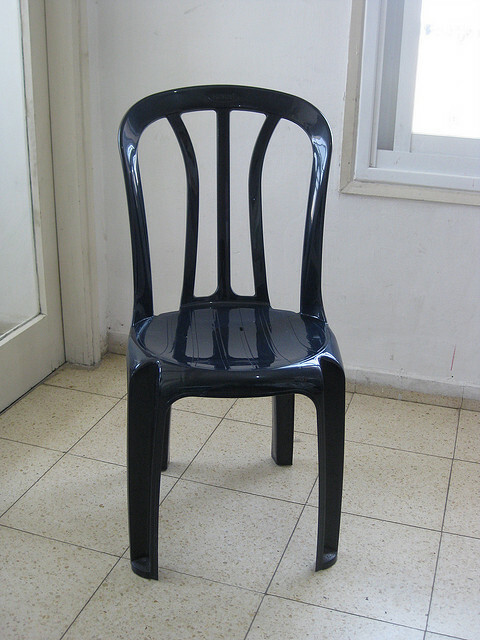 It's a self perpetuating problem, because when I go to shul it is so uncomfortable(HATE Keter chairs!) and unpleasant, that I don't want to return. Which probably makes the men feel that it's not important if the women's side is decent because we are rarely there in numbers!However, I accept responsibility for making the change happen-we can't wait for the men to do it! It does not bother me either way,it makes me happy that my husband goes to shul, so if comfy chairs keep them there, more power to ya! nicer chairs would be nice too, more for the elderly women that attend, than me. I agree in theory in general and in practice on a few items. When we started Rabbi Seidemann’s shul we made sure to give the chairs with the cushions to the women and the hard metal ones to the men even though, in reality, the men spent much more time in shul over the course of the average week. It is very disappointing that not all shuls give special consideration to women, chivalry is dead. In practice, as there are many more men utilizing the shul on a weekly basis, it is logical that the larger space is designated to the men. From the point of tznius, the men should not be seated behind the women. Ideally the sections should be side by side like in Suburban Orthodox. You don’t indicate if the nicer furniture is permanent or portable. If permanent, there was no choice but to give the plastic chairs to the women, although they should have been set up and not stacked in the corner. In summary there are a couple issues at hand. The Torah has certain guidelines for tznius which we must adhere to. Aside from that and keeping that in mind, most scenarios and situations are coordinated by men and unfortunately, too often, these are not the most considerate or even conscientious people. More than once, I've ended up missing mincha while in downtown Jerusalem. I'll be reminded of my obligation by passing a shtiebel--which frequently has no women's section at all. Several times lately, I find myself searching for an alternate place, an alley or an entryway, only to find that the area smells of urine. I should be more persistent, but I find this discouraging. As I come very close to completing my 11 months of kaddish for my dear father I am in reflection mode and look back fondly at the various ezrei nashim (is that the plural?) that I have had the opportunity to say kaddish in and I have to say I was greeted in every situation with respect. 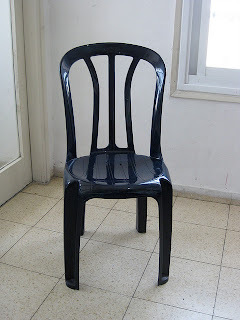 Of course my home base of Shomrei Emunah in our new facility could not have been more physically comfortable however being surrounded by 249 empty chairs often caused a different type of discomfor - lonliness. If woman want to be equal partners in Tefilah we need to show up. Obviously at certain points in our lives it's impossible even downright wrong to go to shul due to child care etc, but we can't expect men to roll out the red carpet if nobody is there to walk down it. Of course, this being said mincha eruv Pesach is my last kaddish, let's see if I put my money where my mouth is after that. Very much agree. While some shuls are "equal-opportunity", there are still so many that relegate the women to inferior spaces. Any shul that I have been an active participatory member of has had the same seating for men and women. I agree with the commenter above about prayer times in office buildings. While I very much appreciate that I am not obligated to daven with a minyan 3 times a day, there are days such as Rosh Chodesh or a fast day where I would like to, but my Jerusalem office has no accommodations for women to join the minyan. It's very nice of you to be Dan Lekaf Zchut of people's intentions. Personally I believe shuls tend to be old-boys clubs and women are just hangers on who annoyingly require some kind of minimal accommodation. The more women come to shul and the more men (specifically the next generation) are educated, the better the situation will become. It's an evolutionary process and like all change in the Orthodox world, comes about slowly. Yet another side to the problem is the matter of acoustics. If a shul is not properly designed, it may be impossible for people in the Ezrat Nashim to hear the voices of the shaliach tzibbur, the baal korei, and the darshan. Which is pretty much the whole point of going to shul. • Baruch Hashem there are many Modern Orthodox shuls, at least here in the states, that have given real thought to womens' seating and participation in the community. Teaneck, NJ has at least 2 (if not 3) Orthodox shuls where the womens' section is pretty much equal to the mens and at least one of the two has a down the middle Mehitza (which is often removed for weddings and other events. • There is some history you are dealing with here. Pre-war Polish Jews, for example, had many communities in which women did not go to shul period. The Ramah shul in Crakow had to knock a hole in the wall when tourist groups began davenning there in the late 1980s because they had never historically had a womens' section. Same goes for some, but certainly not all, of the communities that make up the Sefaradi and Mizrachi worlds. • The Mechitza as we know it is easily 1000 years old; women looking for equal space in davening is perhaps a few decades. Now is the generation that can make widespread change happen but there needs to be a critical mass of women willing to make a noise in their home communities with all the trouble that can bring on them. • Be careful of comments like the one above me that use the value of "tzniut," the behavior of modesty, as an excuse for what is really misogyny. • There are many communities in the Orthodox world in both Israel and the US where you would not experience these things. Are you yourself in the right place? Can you continue to put up with indignities for the sake of remaining part of a community that (I assume) is an important part of your life? Finally - the communities where you experienced the non-tefillah related events, such as the concert or learning, should be embarrassed. I agree with you. I also am sure that, like you wrote, it is unintentional, but it certainly needs to be brought to the attention of those responsible. I'm not sure that the ones who need to see it are reading your blog. I hope you send them a copy. As someone commented, the reason this happens is because men use the shuhl constantly, while women only occasionally. At best women use the shuhl on Shabbos and Yom Tov, but not on weekdays. (Actually it is a big zchut for women to go to shuhl on weekdays as well, as written in Tana Dvey Eliyahu and brought in the sefer Shmirash Halashon of the Chofetz Chaim, but generally people don't know this.) Most women go to shuhl only on special holidays, such as Rosh Hashonoh and Yom Kippur. That's what my mother did, and that is what many others do. My daughters hardly go to shuhl, and even as teenagers when they had the time, they usually preferred to stay home. Because most women are not so interested in going to shuhl, and most shuhls don't have a big budget, the shuhls are not set up properly for women. When there are so few women coming (and caring) they aren't going to invest in expensive seating for women. For a few occasions, or for the small number who do come, they think they can get by with keter chairs. They are not doing this to be insulting, they are doing it because it is more convenient and most women don't care. Again, I'm not saying its OK, I'm just explaining. As for me, personally, I think like this: Hashem hears my tfilos just as well no matter where I'm sitting, and He honors me more, not less, for being forgiving. The same is true when attending an event where the women are seated cramped together at the side as you described. It surely isn't right, and should be fixed, but I'm happy that I can get to hear what I want, and look away from the externals as being unimportant. I know that my value is no less because of these externals. I also have a theory that the women who are most bothered by these kind of things are actually gilguim of the men who did them! That is Hashem's perfect justice. You sometimes need to be on the other side and experience things to truly understand why it is wrong. At any rate, all of this will soon be over with the coming of the ge'ula, may it be soon. Men and women should be able to sit togther, and pray together. All laws contrary to this were created by men, and should be abolished. Period! Hi Rivkah. I manage a Pinterest account for the Eden Center and I was wondering if you'd mind if I posted this article there? Eden Center - Please contact me at rivkah30 at gmail dot com to discuss. Thanks! LOVED THIS. Unfortunately, I can SO relate.